It looks like the scene from Gilligan’s Island in which the professor rigged a bicycle that washed ashore to create electricity. The Occupy Pittsburgh activists aren’t stranded castaways but they do frequently have someone pedaling a bike to generate electricity for their tiny island in the sea of Downtown skyscrapers. 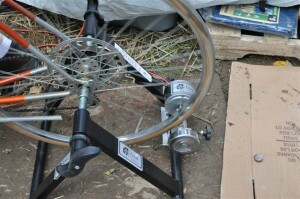 Deep-cell batteries are connected to the bike and, separately, to a solar panel. Alternative energy like the bike and a solar panel are part of the green theme that is associated with the Occupy Movement. The camp of activists has tapped into a growing experimental field for generating electric power in places that are typically off the grid. 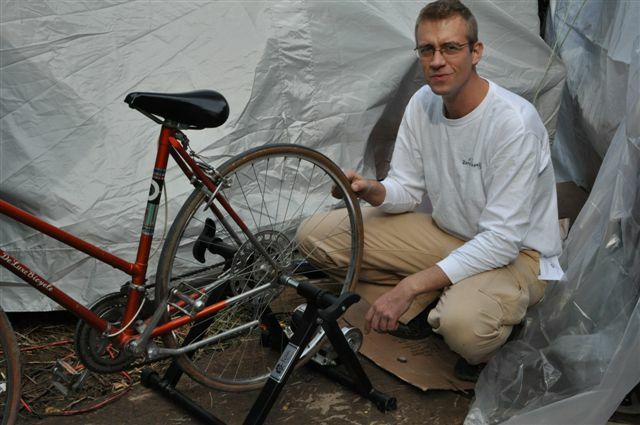 “If you ride the bike for an hour, you get 5 hours of laptop usage,” said Nigel Parry, 43, a web designer and publicist as well as an Occupy Pittsburgh volunteer. He said cell phone charging requires a minimal draw, and thus a shorter ride. 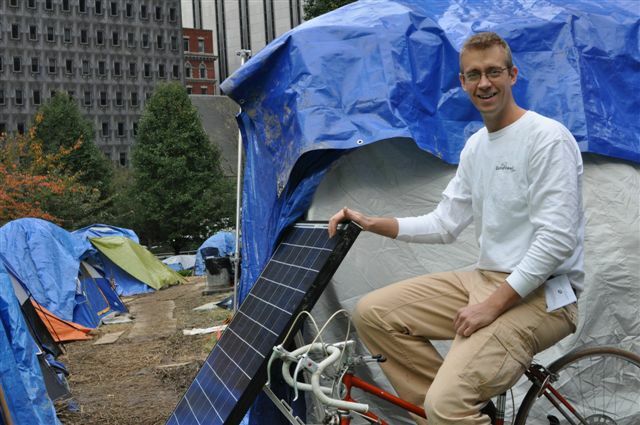 Though the resounding messages from the movement are economic and reflect disdain for Wall Street greed and the need for campaign finance reform, some members of Occupy Pittsburgh stress the need to implement a national alternative energy solution. Occupy is creating a small-scale alternative energy effort at their encampment at Mellon Green at the corner of Grant and 6th Ave with the help of a local company ZeroFossil. 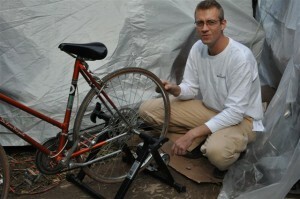 The Munhall company provided the Juice Box: a solar panel and dynamo bike set-up. Through its website, ZeroFossil.com, the company sells power generation systems that utilize free energy including sun, wind, water, and human power without the need for any fossil fuels. 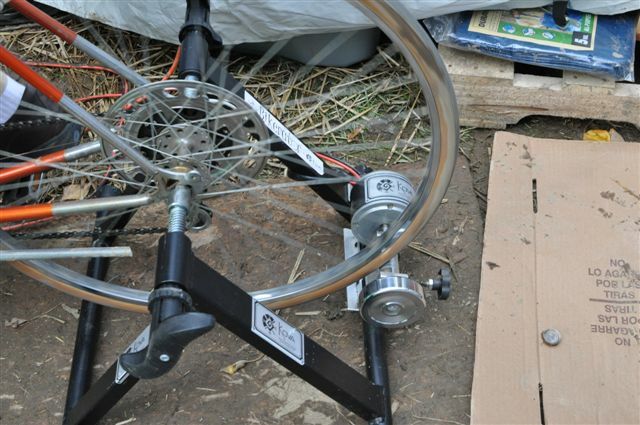 The bike at Occupy Pittsburgh can generate up to 250 watts of power, though most riders only generate about 175 watts. The solar panel also can produce up to 250 watts an hour but because it is located in the shadow of the BNY Building it is only working at 10 – 15 % of capacity. The group is devising a plan to move the solar panel around to get the most exposure throughout the day. “My goal was sustainability – trying to develop a product that was affordable and sustainable to get away from fossil fuels,” said Steven Kovacik, the president of ZeroFossil. Kovacik, who studied engineering at the University of Pittsburgh, started production of his electric-generation systems three months ago. “I had a dream and saved up all my nickels and dimes to start this,” Kovacik said of ZeroFossil. Kovacik has hit on a popular concept with his poratble system. Many companies including Wal-Mart, Ace Hardware, and Costco offer solar and alternative energy systems for camping and tailgating. A Utah company called Humless was conceived from a frustrating camping trip that entrepreneur Glen Jakins took into a redwood forest. A neighboring camper ran a generator for hours that destroyed his peace. Its Roadrunner is a lithium-based generator plus a solar panel that starts at about $695. Humless offers accessories including batteries, speakers, headphones, and even a hand crank option that can generate 35 watts of power. Kovacik’s company offers two platforms. The Juice Box, being used by Occupy Pittsburgh, was designed for camping or tailgating. The solar panel and battery unit is $1,500 and the bikerator accessory is an additional $500. It can be used for AC, DC, or USB power. The second platform offered by ZeroFossil is the Integrator which is designed for home or office power. It is a “Plug and Play” solar format for $5,000 that will accept accessories to utilize wind, hydroelectric, and human power.